Written by experts in design, specification and construction SRIA publications are developed specifically for use by practicing engineers, architects, builders and government. Most are provided free of charge and can be downloaded below. To view or download any document, simply click on the title. Details of a new major test program, explaination of economic advantages of Class L mesh under the new design rules in AS 3600:2001 and recommendation of a new design approach taking into account the extra steel area due to lapping by Dr. Mark Patrick, MP Engineers Pty Ltd and John Keith, SRIA. A paper presented at the Australasian Structural Engineering Conference (ASEC) Melbourne, Australia, 2008 by Dr. Mark Patrick, MP Engineers Pty Ltd, Mark Turner, Institute of Public Works Engineering, NSW and John Keith, SRIA. 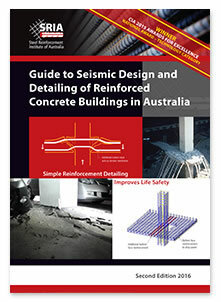 Concrete in Australia V40 N3 Are You Making Your Steel Reinforcement Connections? Since July 2008, the SRIA has funded a research program, with full-scale structural testing of monolithic, reinforced concrete slabs incorporating Class L mesh, being conducted by the Department of Civil Engineering, Curtin University of Technology in Perth. The testing will soon be completed. This is an update on the program prior to its completion and release of the findings.